On this day in 1983 TIME magazine named its first Machine of the Year: the personal computer. It was a deviation from their annual tradition of naming Man of the Year, but was an appropriate one. At that time the PC was making big strides and a big impact on the world at large. As TIME publisher John Meyers wrote: “Several human candidates might have represented 1982, but none symbolized the past year more richly, or will be viewed by history as more significant, than a machine: the computer.” The PC remains the first and only Machine of the Year that TIME magazine has ever named. January 18, 2018: 3D Lab is an interesting program which draws one of several sample 3D objects viewed from multiple angles and elevations under user control. Even though the code is 20 years old, it implements the math behind virtually all of today's CGI productions. Much of the code here is likely implemented in hardware today. Thanks to Earl Glynn for publishing the original program and for permission to re-post it here with a little animation of figure rotation. Cats love to chase mice, pirates love to chase merchant ships, and dogs love to chase rabbits. I recently received an interesting book titled "Chases and Escapes", (Paul Nahin, Princeton University Press). The math gets a little heavy (i.e. Differential Equations), but the initial approach, the "Pursuit Curve" illustrated here, is straight forward and fun to simulate. The Dog chases the Rabbit by always heading toward its current location. If the dog runs faster than the rabbit (and the field is large enough), he will always achieve his goal. This rabbit has a hole where he's safe if he can run at least as fast as the dog. 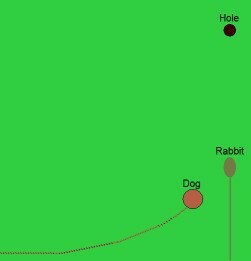 In this Pursuit A program you can control the speed and the dog's location when he spots the rabbit and starts the chase. Lots of room here for enhancing this program or adding other chase strategies. Of the 450+ programs on DFF, Wordstuff is one of the two that have earned places on my desktop. BruteForce, an integer algebra solver is the other. These are the "go to" programs when I need help with our Daily Mensa© Calendar puzzles. 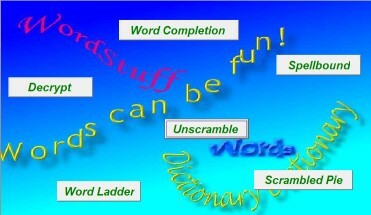 Wordstuff is a "wrapper" for six programs solving or helping word based puzzles. Over the years, many bugs fixes have been applied but enhancements can introduce new ones. Updates today fix annoyances in the Word Completion and Unscramble sections. Use the link above for more details and to download the program if interested. March 15, 2018: A few years ago, someone came looking for Delphi code to allow highlighting specific words in a DBGrid (database grid) control. I don't use DBGrids, but StringGrid controls serve as a good substitute, or so I thought. One of the StringGrid features not available in DBGrid was originally used to expand column widths when highlighting text size. Code was changed to eliminate use of hat feature, but the unused code remained in place. A fellow programmer wrote last week informing me of the problem when converting to use a DBGrid. GridWordHighlight Version 1.1 posted today, removes the offending code and should work for either grid type. 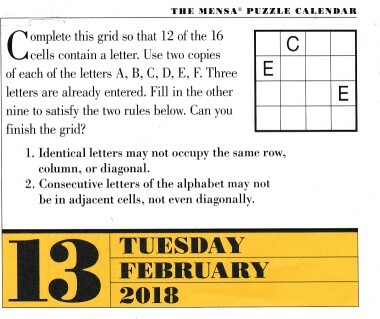 Here's the February 23 Mensa puzzle that resulted in No Close Neighbors Version 3.0 posted today. Two added features for this puzzle make it several times more difficult that the original. It's only slightly more difficult for the computer program to solve, but much harder for humans trying to solve it manually or for the programmer trying to tell the program how to do it (me!). The original puzzle did not allow repeated letters and told you where the unused cells laid. This puzzle changes that. If you're up for a challenge, check it out.